The War Crimes Act, 18 U.S.C. § 2441, makes it a crime for any person, “whether inside or outside the United States” to commit a “war crime.” War Crimes are defined as any grave breach of the Geneva Conventions, and in particular, any conduct that violates common Article 3. In Hamdan v. Rumsfeld, the Supreme Court explicitly ruled that common Article 3 applies to alleged Al Qaeda members and the so-called war on terror. The crimes of torture, cruel or inhuman treatment and murder — all acts that are documented by the Senate Torture Report — are specifically prohibited by common Article 3 and the War Crimes Act. In 2006, the government enacted the Military Commissions Act of 2006, which severely curtailed the reach of the War Crimes Act, limiting its application well short of the protections of common Article 3. It also passed a provision that provided for retroactive immunity for certain government personnel who were following orders in implementing what they thought were lawful directives from the President (this section can be found at 42 U.S.C. § 2000dd-1). The Washington Post noted at the time that the intent of these changes was to reduce the threat of future prosecutions when the day came when such abuses would be revealed to a shocked public. These provisions remain untested. It is my belief that any person involved in the chain of command that authorized the crimes detailed in the Senate Torture Report should be indicted for war crimes and conspiracy to commit war crimes under the War Crimes Act. This includes George W. Bush, Richard Cheney, Donald Rumsfeld, CIA officials who condoned or engaged in such practices, and attorneys who authorized such practices, including Alberto Gonzales, Jay Bybee and John Yoo. The United States is a signatory to the Convention Against Torture, and its implementing legislation is at 18 U.S.C. § 2340A. 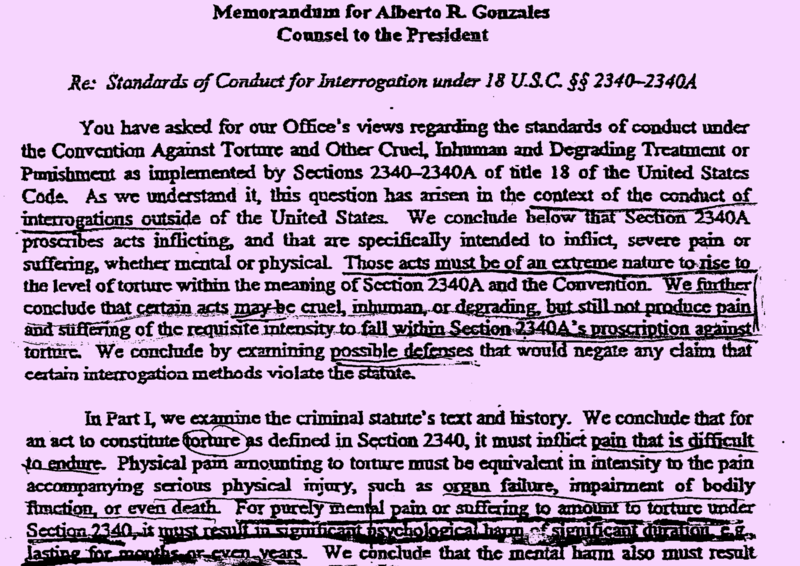 This statute was the famous subject of the “Torture Memos,” a series of legal opinions written by John Yoo and Jay Bybee regarding the limitations of this law. Bybee famously concluded that “torture” under the law only referred to “the most egregious conduct,” “equivalent in intensity to the pain accompanying serious physical injury, such as organ failure, impairment of bodily function, or even death.” “Purely mental pain or suffering” had to result in “significant psychological harm of significant duration, lasting for months or even years.” Bybee even thought that the Convention Against Torture might be unconstitutional because it would infringe the “President’s authority to conduct war.” Today, Jay Bybee has a lifetime tenure-ship as a judge on the United States Court of Appeal for the Ninth Circuit. John Yoo is a law professor at UC Berkeley School of Law. As with the War Crimes Act, the Convention against Torture provides a second basis for criminal prosecutions against people who authorized, engaged in, or ratified torture. President Obama repudiated the Torture Memos in 2009, but he also refused to issue indictments or discuss whether such conduct was actually criminal. He — or someone more brave — would do well to consider that decrying illegal conduct but then refusing to prosecute such conduct is a silent pardon at best, and complicity at worst.